Neuron-specific PERK inactivation dramatically increased axon degeneration during EAE. (A–C) Fluorescent images of the whole lumbar spinal cord revealed that the percentage of the white matter area that displayed noticeably reduced EYFP intensity was significantly increased in PERK-nKO EAE mice compared with that in control EAE mice at PID 38. Insets show EYFP+ axons. n = 6 animals. 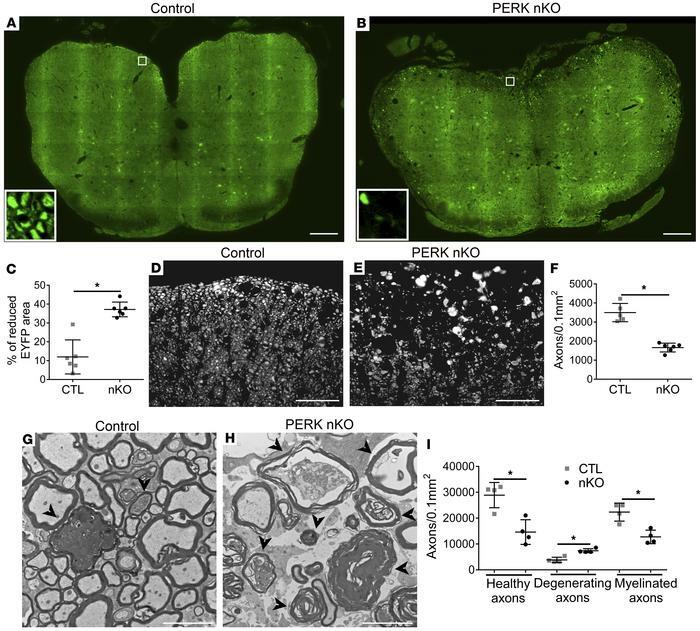 (D–F) SMI31 IHC revealed significantly fewer axons in the lumbar spinal cords of PERK-nKO mice with EAE compared with those in control EAE mice at PID 38. n = 6 animals. (G–I) EM analysis confirmed that the number of degenerating axons (arrowheads) was significantly increased, and that the numbers of healthy-looking axons and myelinated axons were significantly decreased, in the lumbar spinal cords of PERK-nKO mice with EAE compared with those in control EAE mice at PID 38. n = 4 animals. Scale bars: 200 μm (A and B); 50 μm (D and E); 5 μm (G and H). Error bars represent SD. Statistical analyses were done with a 2-tailed t test, *P < 0.05.